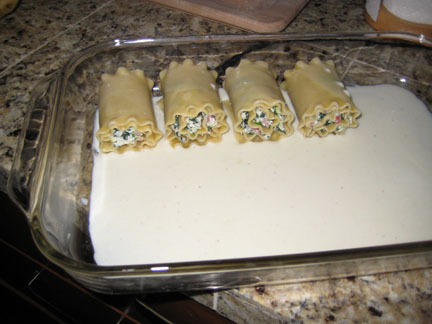 I tried a new ‘kid friendly’ recipe last night that I really liked: Lasanga Rolls (from Giada on the Food Network). The kids complained bitterly, as they always do when I make something new, but once I threatened them with no dessert ever until you die, they ate it, and actually liked it! I loved it and will definitely make it again. Although next time I will cut the spinach in half, up the prosciutto by 25% and use an entire jar of marinara on top instead of on the side. I recommend you try it for your kids, or your dinner guests. 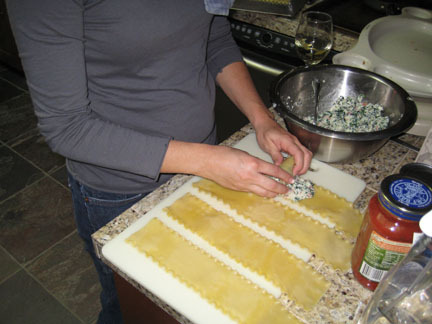 4 Responses to Lasagna Rolls – Success! Yeah, they were awesome, tasted really good. The saltiness of the Prosciutto went well with the spinach. Definitely will eat it again. Oh sure. I just sign up for a weight loss challenge and you post photos like this? Looks delicious! Yum. 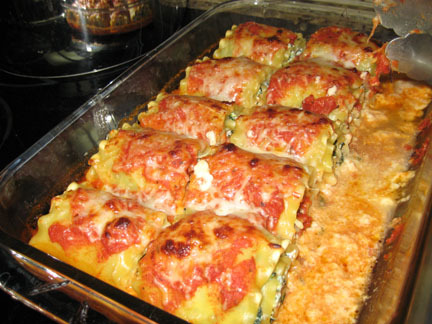 They look like lasagna enchiladas.